Things change, do they not? Say you're strolling from the waterfront to the town centre along groovy St Peter's Street. There, on the right, is the charmingly bijou Baker & Barista. Except that, due to a trademark infringement from another company who'd already registered the name "Barista & Baker", they've now rebranded as Applaud Coffee. Further up that same side is the glass-fronted and relaxed Saints. Except that it's now Jay B's, apparently the only Spanish tapas cafe in Ipswich. Closer to town and facing the site of the old Ipswich Hippodrome used to be the upmarket Galley, except that they've now poshed off to concentrate on their W**dbridge branch. 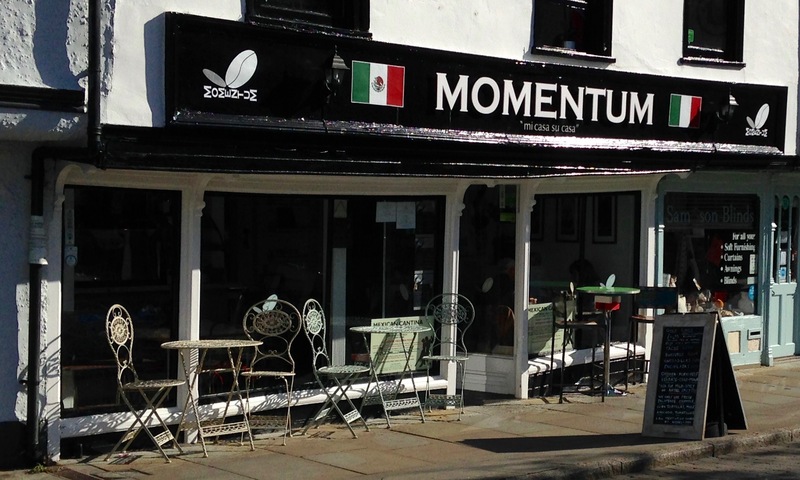 Galley gone, meet Momentum, a new Mexican cafe stroke cantina as you couldn't really tell from the name. Maybe Montezuma would give customers the wrong idea. Warm welcome from the authentically accented guy with the menus, and yes please, we'll take this table downstairs. Lunch deal has a taco or torta or ciabatta plus a soft drink for a friendly fiver. That'll be a BLT for Andy, gammon and mustard ciabatta for me, and because this is a flippin' Mexican place, Kev takes the tacos with extra jalapenos, senor. All very fresh, all well presented, all good, and the beverage selection is splendid with San Pellegrino, Fentimans, Cawston, etc. Other tables are occupied, and there's folk upstairs too. Staring at us from a shelf is a cookbook entitled Death By Burrito. Imagine. Time for sweet treats from the tempting display. Smiling guy brings us lemon tart, tiramisu and an especially chocolately brownie with ice cream. We'd all return here to sample the fuller evening menu, and I think Kev would ideally like an edible taco hat. If it was a car -- Mastretta MXT. If they were passing by -- Giovani dos Santos.